My apologies for not sharing activities last week. The week ended up going a little differently than I had anticipated. All three older kiddos had specialist appointments which required a little travel. Sunshine celebrated her second birthday. Daddy's work schedule changed yet again, which added for some fun and interesting changes in our routine. Lastly, Lily outgrew her nap. Amazingly, we were able to fit in a lot of learning time, but it wasn't always in the way I usually plan. One day we even took a field trip. Unfortunately, I forgot my camera. This week we're studying the Pilgrims. I had all of these fabulous thoughts of creating amazing and original activities, but plans don't always materialize. 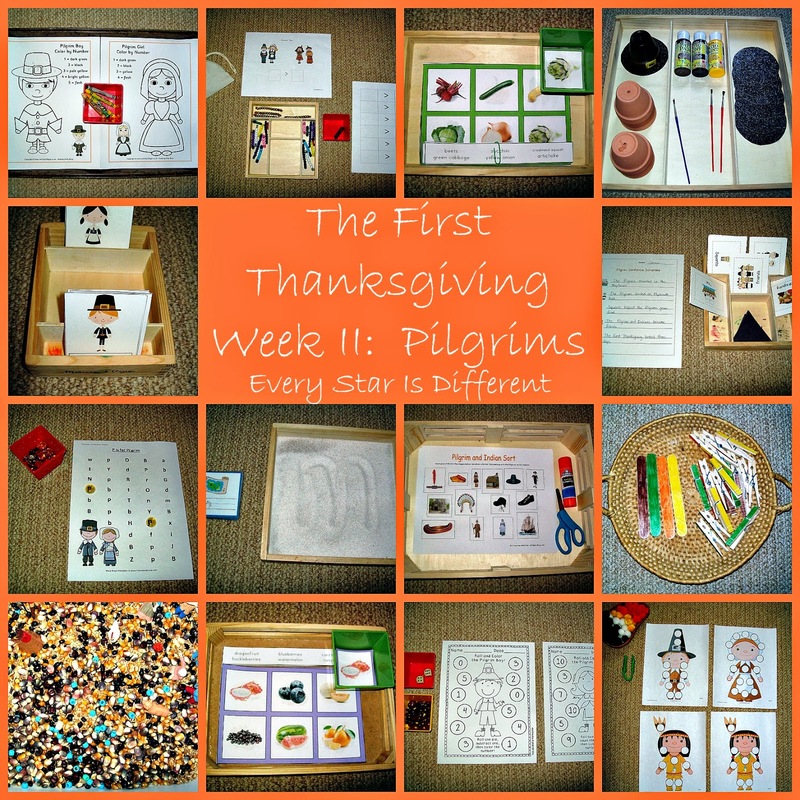 I've learned the theme of Pilgrims is a challenging one, best taught through the reading of fabulous books, with a few added activities. Mind you, our shelves are still full. I found some amazing free printables out there! This activity has been on the shelves for several weeks now with a rotation of uppercase letters, lowercase letters, and numbers. I'm hoping that this will be the last week. Bulldozer is becoming quite proficient at writing all of his letters and numbers in the sand. It has been such an added bonus that Bulldozer LOVES this activity and chooses it every day. He has really needed the practice. Source: The free lowercase letter cards can be found at Homeschool Creations. Dinomite and Princess mix up their b's and d's, and p's and q's on a regular basis. I was super excited to find this activity, as it will help them with their identification of the correct letters in a fun way. Source: I found this free printable at Crystal & Co. This is a continuation of our Indian Irregular Plural Matching activity last week. Source: I found this free printable at Speech Room News. I fell in love with this activity when I found it. I had been looking for a great sequencing activity for Bulldozer, as he struggles with that. I also wanted to find a history activity, as I had none on our shelves. We're reading a lot of books this week as part of our history and culture study but I was looking for more. This activity ties everything I needed into one activity and more! I'm not using it exactly the way its creator intended, but it's working out fabulously for us. There are five sets of cards. Each set has a different picture on it. Within each set are six word cards. One must arrange the six cards to create a sentence describing a Pilgrim event. A worksheet is provided for children to write the sentences once they create them. I've decided to use the worksheet as a control to help the kiddos form their sentences, and to help them sequence the five sentences/events. To make the activity even greater, I decided to add in the Montessori black triangles for Dinomite. He's been studying nouns during his morning work for over a week now. Once he has all five sentences put together he'll place triangles above all of the nouns. I'm so excited about this activity! Source: I found this fabulous free printable at Teachers pay Teachers. I made the triangles out of construction paper, but am considering upgrading to felt shapes as we do further work on sentence structure. I love the option of a girl or boy with this activity. All of the kiddos were thrilled. The kiddos will roll the dice, add the numbers, and place a marker on the answer. When they've placed markers on all of the numbers, they'll be done. I'm loving dice activities, as Bulldozer does so well with them! Source: I found these free printables at A Cupcake for the Teacher. One of our goals for the month is to master greater than/less than problems. Dinomite does quite well with them. This will be the first time I introduce them to Bulldozer and Princess. I'm hoping they'll grasp the concept without too many struggles. I found these cute Thanksgiving printables to use. Inside the bag are numbers they select for the problem. The Montessori beads are there as a control, in case needed, when deciding which number is bigger. The final step will be to write down the problem on the record sheet, so we're able to keep track of how many problems each kiddo answers, and to practice our number writing. Source: The free Thanksgiving printables with numbers can be found at Royal Baloo. Now that we've studied Indians and Pilgrims, I wanted to see how well the kiddos did at sorting out attire of each group. Plus, I really wanted to sneak in a cutting activity. It's been a while. Under the sheet with the cut outs is a sorting sheet where the kiddos will glue their pictures. We continue our study of the food groups this week with fruits and vegetables. I love this printable because there are so many different fruits to match and identify. I find myself having to use the control, which means I'm learning too. That's always a great thing! Source: I found this free printable at The Helpful Garden. We've used this game before as part of our Easter Unit. It's always fun to bring out activities from the past. The kiddos love it, as they feel confident knowing how great they'll do, before they even start. Our artist of the month is Jackson Pollock. In case you don't know who he is, just open your Olivia book (the original), and you'll remember. This week we'll be making our own masterpieces, using the same method he does, perhaps just a little modified. I made sure to water down the paints to help with the splattering. This activity I did come up with all on my own, purely by accident. (I literally almost ran into the pots at the craft store while looking for ideas.) But I must say, it turned out beautifully. The best part is that it's SUPER easy for little ones! The first step is to turn the pot upside down to look like a pilgrim hat. Paint the pot black to the ridge. Below the ridge (where the belt is), paint brown. Once all is dry, which if using the correct paint shown above, will take less than 5 minutes, paint a yellow buckle on your brown belt. I used glittery black card stock for the rim of the hat, however plain black would look great too. You can glue the rim onto your pot, but thanks to our adhesive allergy boy, we won't be able to do so. Perhaps we'll stick some surprise treats inside the hat for kiddos to find while they're waiting for their food to be put on their plates and cooled. I'm super excited to use these for name cards at our Thanksgiving dinner table. All I have to do is insert a stick in the hole at the top of the hat, with a little card attached. They'll look adorable! We haven't had a coloring activity on the shelves in a very long time. I thought this might be fun as we learn about the clothes the Pilgrims wore. The color by number aspect of the activity makes it so the kiddos have to use the right colors. Source: I found these free printables at Activity Village. We're studying the works of Aaron Copeland this month. The kiddos are having so much fun listening to his music, drawing pictures, etc. They also continue to participate in their church music program. We continue to participate in our family exercise program. The kiddos will use the tweezers to place pom poms on the printables. I provided different colored pom poms to provide variety in their pictures. Source: I found these free printables at Crystal & Co. This is the same sensory bin from last week with the addition of all of our Indian corn kernels and Pilgrim minifigures. It was a huge hit last week. I can only imagine how excited they'll be this week with new characters. Source: I created this sensory bin. I have seen this activity everywhere, but have never had it on our shelves. I decided this week to give it a try. Instead of painting the sticks and clothespin or gluing pretty paper to them, I just used marker to color. It may not look as pretty, but it's fast and doesn't take forever. And that's our week! Next week we'll spend more time focusing on the Thanksgiving meal, tables manners, and take advantage of all those turkey activities being shown around.